Erosion Landforms: What Is A Tea Table? The erosion that leads to the formation of tea tables may be as result of moving water, ice or wind. 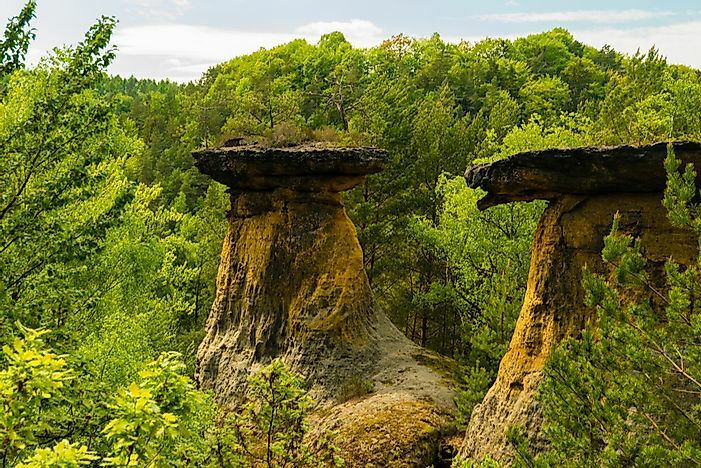 Tea tables are an example of hoodoos. A tea table is a rock feature formed on the surface of the earth as a result of the erosion of the uppermost strata, leaving a vertical rock formation whose top surface is wider than its base due to erosion and weathering resistance. Tea tables are composed of distinct layers. The shape of the rock formation resembles a regular tea table, hence the name. The top layers are wider than the bottom layers because of the greater resistance to erosion and weathering. The lower surfaces of the tea table are observed to have undergone intense erosion than the upper parts. The lower parts in most instances are assumed to have been softer than the upper parts of the tea table. The softer parts are easily eroded, leaving most of the hard parts intact, or less eroded. The erosion that leads to the formation of tea tables may be as result of moving water, ice or wind. These agents of erosion work on the particular part of the earth surface such as a rock with erosion occurring on certain parts and leaving other parts intact. The part left intact is usually due to the resistance to erosion. The process does occur over a long period of time.It is usually very gradual and can take even a century or more for the tea table to be formed. Geologists argue that a tea table can take a short period such as few hours to be formed, or it can take even 1,000 years to be formed, depending on the intensity of the erosion agent.The intensity of the agent of erosion also determines the width of the base of the tea table. If the agent of erosion was on high speed, the width tends to be smaller. This is because when the agent is moving at a high speed, it tends to hit hard on the earth’s surface.When the surface is made of tough rock, the process is even slower. The agent carries the eroded parts of the earth’s surface and deposits it in other area. Tea tables may occur anywhere on the earth's surface. They may occur on the edge of cliffs or just beyond the bluffs. They may also occur at the edge of a ridge. Tea tables can also be small in size, just like regular tea tables or large surfaces. Examples of Tea Tables include those found in the south of Illinois’ Shawnee National Forest. The Devil’s Tea Table is located in Athens County in Ohio. Tea Tables are unique geographical features. For this reason, some people tend to believe that they were formed through supernatural powers. It was for this reason that the most popular tea table was named the Devils Tea Table. Due to their unique shape and rare occurrence, tea tables attract a number of tourists. What Was the Tea Act?